Summary: The Chamberlain CWA2000 wireless driveway features an alarm sound that is very low and a sensor that is not accurate. 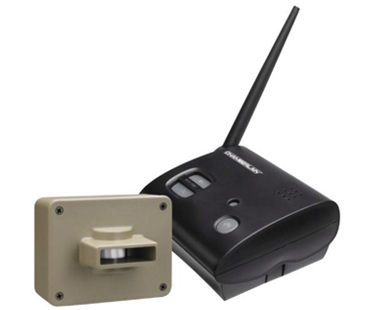 The Guardline GL2000 or the Dakota 2500 are much better options for a driveway alarm. The Chamberlain CWA2000 detects animals, people and vehicles, using a PIR sensor. The packages include 1 receiver, 1 motion sensor, 1 adapter, mounting hardware and instructions manual. You’ll need to purchase the batteries separately. Like most driveway alarms, the Chamberlain CWA2000 features a sensor that detects movement and a receiver that will notify you whenever there’s any movement on the driveway. The receiver can be placed anywhere in the house (countertop, desk, etc…). It is recommended to mount the sensor in an area protected by sun, wind and heavy rain. The Chamberlain CWA2000 has a long range and it comes with many useful features such as adjustable sensitivity and LED lights. However, the ring tones are so low you can barely here the alarm. Also, the sensor won’t constantly detect people or vehicles. The Guardline GL2000 is a reliable alarm for detecting people and vehicles. The Dakota 2500 is really accurate at detecting vehicles only.